One captive pair of this species learned to mimic chickens, gulls, steam whistles and dogs yelping. L.l. 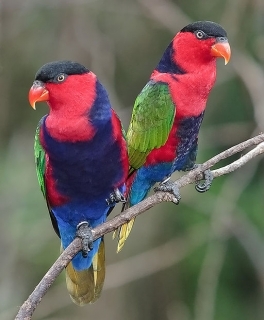 lory: Both adults in general red; black forehead; black lores and occiput, all with purple gloss; dark blue band on back of neck; blue mantle; bronze/green wings; dark blue lower breast and undertail coverts; dark blue on sides of breast, meeting with blue mantle; underwing stripe yellow; red tail with wide blue/black tip. Bill yellow/orange. Dark grey cere. Eye orange/red. L.l. erthrothorax: Both adults red on lower breast, blue on sides of breast absent; band across back of neck narrower. L.l. somu: Both adults as in erthrothorax but blue on back of neck absent. L.l. salvadorii: Both adults as in erythrothorax, but with dark blue underwing coverts; band on back of neck dark blue; centre of abdomen black and wide black band across lower breast meeting with underwing coverts. L.l. viridicrissalis: Both adults as in salvadorii but with darker more black band on back of neck; in male underwing coverts washed with dark blue, in female dark blue. L.l. jobiensis: Both adults as in salvadorii but with pink/red tint to red breast; yellow underwing band absent; lighter blue mantle and stripe across back of neck. L.l. cyanuchen: Both adults in general blue markings lighter and less black in colour than in salvadorii; red on nape absent, blue of back of neck meeting black of crown and occiput. L.l. lory: As in adults but dark blue on upper breast; blue lesser underwing coverts. Cere and bare eye ring pale grey. Bill brown. Eye brown. L.l. erythrothorax: As in adults. L.l. somu: As in adults. L.l. salvadorii: As in adults. L.l. viridicrissalis: As in adults. L.l. jobiensis: As in adults. L.l. cyanuchen: As in adults. Calls given in flight are raucous two-or-three syllable whistling notes with upswing at end. Interspersed with loud calls. Gives whistles and squeaks while perched. Common until the 1960's when export began to cease. Enclosure with well-drained floor, or suspended aviary over concrete sloping floor. Nectar - commercial or homemade (mixture of lactose-free baby cereal, honey and malt extract or molasses, mixed with filtered water, made fresh once or twice daily; fruit such as: apple, pear, orange, cactus fruits; one or more of the following vegetables daily: carrot, fresh corn on the cob or tinned corn (salt-free); green leaves such as: Swiss chard, lettuce, dandelion; rearing food made from hard boiled egg, wholegrain bread and carrot, ground up to crumbly consistency. Socialization, bathing (necessary daily because of liquid diet), puzzle toys, bird-safe chew toys, ladders, swings. Diagonal nest box 16" x 8" x 12" (40.6cm x 20.3cm x 30.5cm). L.l. lory: Waigeu, Batanta, Salawati and Misool, W Papuan Islands, and Vogelkop, Irian Jaya. L.l. erythrothorax: S New Guinea, west in south to Onin Peninsula and southern edges of Geelvink Bay, Irian Jaya and in north to Huon Peninsula, Papua New Guinea. L.l. somu: W Papua New Guinea on southern side of central range in Karimui Basin and Lake Kutubu to Fly and Purari Rivers. L.l. salvadorii: N Papua New Guinea from Astrolabe Bay west to Aitape district. L.l. viridicrissalis: N Irian Jaya from Humboldt Bay west to Mamberamo River. L.l. jobiensis: Yapen and Mios Num Islands, in Geelvink Bay. L.l. cyanuchen: Biak Island, Geelvink Bay, Irian Jaya. Found up to 1000m (3280 ft) in primary forest and forest edges, also has been recorded in well grown secondary forest. Also occurs in partially cleared areas and swamp forest. Includes pollen, nectar, flowers, fruit and insects. Usually found in pairs and small groups, and may occur in parties of 10 or more when meeting to feed in flowering trees. Forages in middle storey or canopy. Quiet and inconspicuous.